I’ve never seen a bee like this. Really cool! I think that it is still official even though my first name is misspelled. At the end of the class we took the written portion of the NC Certified Beekeepers test. I’m a little ambivalent about that — I still haven’t been in my first hive, but I was able to take the first part of the test to become a certified beekeeper. The second part will take place in April when we have to complete the “practical”portion — showing the examiners that we know how to work with an actual hive of bees, identify brood cells, eggs, pollen cells, get in and out of a hive with as little disruption to the bees as possible, etc. I don’t know that Matt and I will even have our hives by then so we may still be complete “bee virgins” when that portion of the test is given. The examiner, who is the President of the North Carolina State Beekeepers Association, said that we would only hear from him if we didn’t pass the test. So far, no word from him. 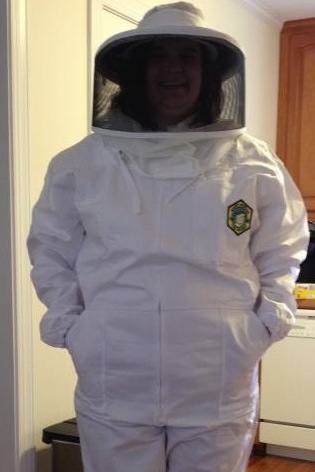 I guess that I could be one half of the way to being a certified beekeeper! The bee school on Saturday was hard because I was suffering from a migraine and (as I found out later) was coming down with bronchitis. I felt awful. But we had a presentation from a commercial beekeeper that was sooooo interesting. Jeff Lee, the owner of Lee’s Bees in Mebane, NC, is a commercial beekeeper that uses his bees to pollinate. Honey is very secondary to his business. As he pointed out, pollination is the most important thing that honeybees do — pollination helps the plants make seeds (seed production). Jeff explained that there are 130 agriculture plans that require bees in the pollination process in order to produce their fruit, vegetable, whatever. The estimate is that honeybees increase crop yields by $15 BILLION annually. Jeff takes his bees to California in February for the almond trees. He has over 1700 hives and trucks almost 500 hives across country. He said that there aren’t enough bees in the United States to send to California in February for the almond crop — almond trees are 100% dependent on honeybees for pollination and production of the almond nut. He then trucks his bees back to NC for the blueberry crops. Then up to Maine for the blueberry crop. Then down to NC for the cucumber crop. All of this is extremely tough on the bees. Some farmers require 8 – 10 hives per acre which causes a lot of competition among the bees and they weaken. Jeff is constantly monitoring their healthy, not only from over competition but also from the pesticides that a lot of the farmers use. Both Matt and I were fascinated by this — and convinced that commercial beekeeping wasn’t in the cards for us. Hobby beekeeping looks more and more like our thing. And best news: at the end of the class, Matt won a nuc during the door prizes! So we know that we have a least one hive taken care of. I won a bee brush. Not as exciting as a nuc, but one less thing that we have to buy. We are planning on a trip to the beekeepers supply store within the next two weeks to buy our hives and other equipment so that we can start building our hives. SO EXCITED! With each thing we learn, we are more excited about being beekeepers. I have one goal for our first year: get at least one hive through next winter with a fairly strong colony. Matt wants to extract a little honey, but promises that he won’t steal any honey from the bees from their winter store in order to do so. 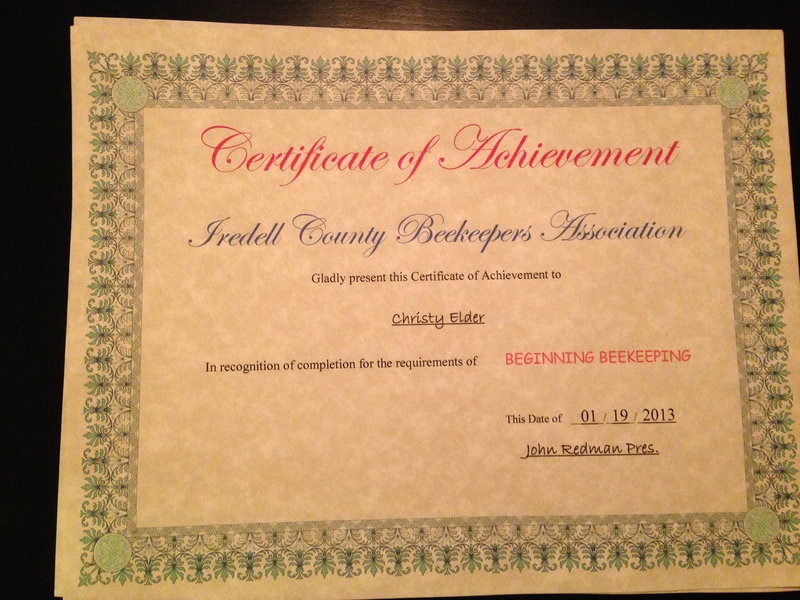 I wonder if I should add “NC Certified Beekeeper” to my business cards? This is a really exciting time — Matt and I are going to do it — we’re going to start beekeeping. We bought “Beekeeping for Dummies” (though I am reluctant to call myself a dummy — just uneducated — I think “dummy” implies unable to learn). And we took the first day of a two-day beginner’s beekeeping class this past Saturday. We’re spouting all kinds of beekeeping vocabulary these days: frames and foundation, deep hives and supers, varroa mites and top feeders, broods, drones, queens and workers. We sound like we know about bees. I want bees now!! I can’t wait to see them build out the foundation, to try to see eggs, to see them start to make their honey. It’s going to be hard not to have my nose in their business all the time.